Mars today (despite the presence of a small amount of a liquid water) is a dry, frozen place. But this was not always the case. Ancient Mars was likely warm and wet, much like Earth. So what happened to change it? Thanks to brand new results from NASA’s MAVEN mission, announced today, we may finally know. 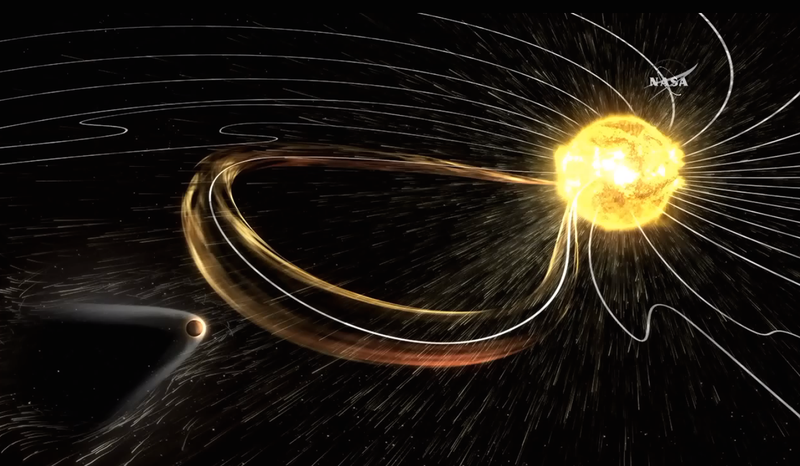 Over the last year, MAVEN has been studying Mars’ atmosphere carefully. Using that data, researchers revealed (along with the simultaneous publication of the results in Science and Geophysical Research Letters) that, under bombardment from solar winds, Mars’ atmospheric gases were being stripped away. So, if Mars was a once a wet planet that lost its water along with its atmosphere, what about Earth? Should we worry that our own home might one day look like the red planet’s dry, dusty surface? Fortunately, there’s something significant standing in the way: Earth’s magnetic field. Of course, as researchers noted during their announcement of the results today, 3.7 billion years ago, early Mars also once had a geomagnetic field protecting it, a fact that allowed its ancient waters to flow. It was losing this that set off the chain reaction that eventually turned Mars into the dusty, red, frozen surface that we know. “The turn-off of the magnetic field is what allowed the turn-on of the stripping by the solar wind,” noted Jakovsky.